LiveProject Team Viewer allows you to view and print your project's .MPP file on any computer without the need or cost of multiple Microsoft Project licenses. LiveProject Team Viewer lets you encrypt and safely distribute your project, share documents and track revisions, thereby allowing you to keep everyone better informed and on schedule. 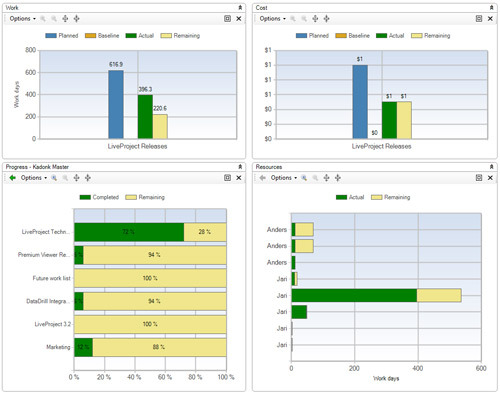 Includes Project Dashboards and Project Portfolio Dashboards. - Ability for you to view and share Microsoft Project - .MPP files and documents. - Microsoft Project - not needed to view your project files. Qweas is providing links to LiveProject Team Viewer 5.1.1 as a courtesy, and makes no representations regarding LiveProject Team Viewer or any other applications or any information related thereto. Any questions, complaints or claims regarding this application LiveProject Team Viewer 5.1.1 must be directed to the appropriate software vendor. You may click the publisher link of LiveProject Team Viewer on the top of this page to get more details about the vendor.